Puerto Rico's pension system was in crisis. Hurricane Maria made it into a catastrophe. "We're going to have to go back to the drawing table and see how we can restructure the pension system in a way that's sustainable," says Sergio Marxuach, policy director with the Center for a New Economy, a think tank in San Juan. "If we don't get any extra money, it may come to deciding whether to build a new hospital or make a pension payment," Marxuach says. "And that's a situation that nobody wants to be in." The origins of Puerto Rico's pension problems go back decades. The provincial government expanded retirement benefits -- like a summer bonus and employee loan programs -- but didn't set aside enough money to pay those benefits in the future. 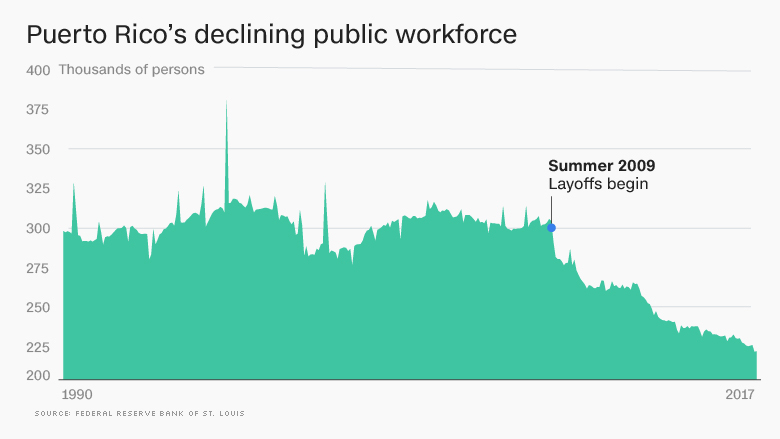 Although the defined benefit plan, which guarantees future payment levels, was closed to new employees in 2000 and many perks later eliminated, the system is scheduled to run out of money in 2018. After that, the government will have to dig deep into its general revenues to keep the pension checks flowing. 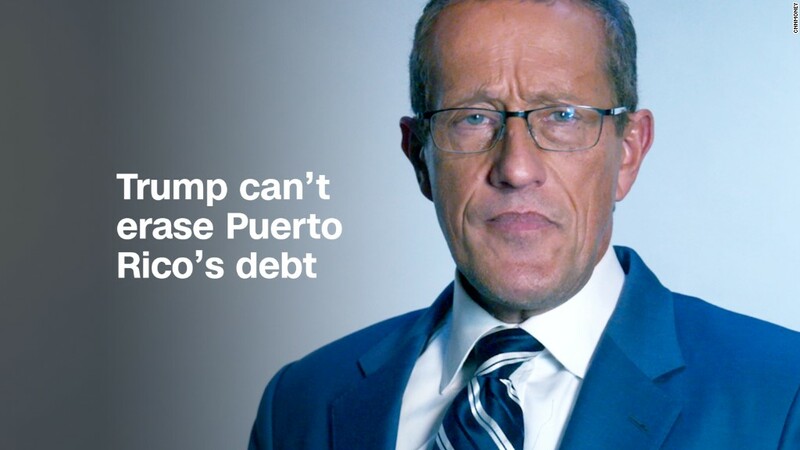 In 2016, Congress passed a law called PROMESA, which created a bankruptcy-like process for resolving Puerto Rico's pension liabilities as well as its $73 billion in municipal debt. The retirement systems cover about 257,000 people, 119,000 of whom are currently working. Under a plan proposed by PROMESA's appointed oversight board, pension benefits -- which are already lower than in most states, with an average monthly payout of $1,525 for teachers and $1,106 for other employees -- would be cut by about 10% for most participants. Current workers would be furloughed two days a month to save money. The elected government of Puerto Rico has resisted that plan, and the oversight board has backed off the furlough idea as all government workers have been needed for rescue efforts. But the hurricane only deepens the fiscal crisis. A bankruptcy plan needs to pass muster with a judge as "feasible," meaning that the company or government entity will continue as a going concern without further reorganization. For Puerto Rico, Maria has drastically altered that calculus. Here's why: Puerto Ricans were already leaving for the mainland as the island's economy foundered. The hurricane will turn that trickle into a flood, as working-age people leave in search of work, homes and schools for their kids. "I try to avoid saying this, but for many people in Puerto Rico the best option is to move to the mainland, because they need jobs," says Barry Bosworth, a scholar at the Brookings Institution who has studied Puerto Rico. "The only people who'll stay there are retirees who are not dependent on jobs." On top of that, the island's already crumbling and indebted infrastructure systems have been decimated, making it difficult to attract businesses that would employ people and pay the taxes that fund the pension system. Nevertheless, the idea of squeezing benefits further will be hard to swallow, because the island's retired population has been hit hard by the hurricane. "I don't anticipate larger pension cuts," says Andrew Biggs, a member of the oversight board who is also a scholar at the American Enterprise Institute, noting that he doesn't speak on the board's behalf. If Puerto Rico is to make good on its obligations to former government workers, it needs to be able to afford ongoing pension payments -- which means getting help from the U.S. government for almost everything else. For example, many economists and advocates say Puerto Ricans should get the full benefits of safety net programs like Medicaid and the Earned Income Tax Credit. Right now, they get only partial benefits under Medicaid, and the tax credit doesn't apply to Puerto Rico at all. Building a more resilient energy grid would mitigate the impact of future hurricanes and attract private investment. "There is a structural problem with Puerto Rico that is fixable," says Simon Johnson, an economist at MIT. "The amounts of money involved are very small relative to the federal budget."